In a Nutshell: Erik Jones took the checkered flag 2.855 seconds ahead of teammate Daniel Suarez to win Friday night’s WinStar World Casino & Resort 350 at Texas Motor Speedway. Jones survived losing nine seconds to Matt Crafton on pit road and recovered to take his third win of the year. Ryan Blaney finished third, followed by Crafton. Tyler Reddick rounded out the top 5.
Who Should Have Won: Erik Jones was easily the class of the field, leading 117 of 147 laps. After running 14th and 13th-quickest in the two practice sessions on Thursday, Jones followed up with a fifth-place qualifying run and spent just 12 laps working his way to the front. But it wasn’t smooth sailing for the No. 4 team. 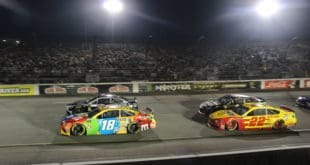 After a freak accident saw a lugnut get lodged in the jack under a green-flag pit stop, Jones cycled from more than two seconds ahead of Matt Crafton to more than five seconds behind. But the lone caution that flew for debris allowed Jones to close that gap and take the lead again. He led a total of three times, including the final 12 circuits en route to victory lane. 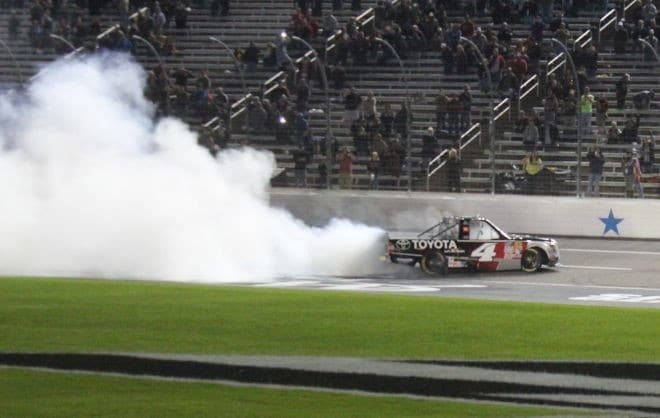 With his win Friday night at Texas Motor Speedway, Erik Jones walks away with a 17-point lead over Matt Crafton, and while anything can happen mathematically, there’s no reason to believe that victory didn’t seal up the championship for the rookie. With just two races remaining, there’s very little chance that Jones will lose the lead, especially given that he’s the two-time defending winner at Phoenix and has dominated in both outings at the track. Obviously with a potential 36-point swing each week, it’s certainly possible for the No. 4 team to crumble, but considering the freak incident they suffered with a random lugnut lodged into the jack that still turned into a win, it’s highly unlikely Crafton or Reddick will be able to mount enough of a charge to take the point lead. Let’s play with some numbers for a moment. Jones has two Truck Series starts at Phoenix and a perfect record to go along with it. He went to Victory Lane in both of those starts, leading 198 of 276 combined laps along the way. You can’t really get much better than that, and I would be shocked if he didn’t make it three in a row next weekend. 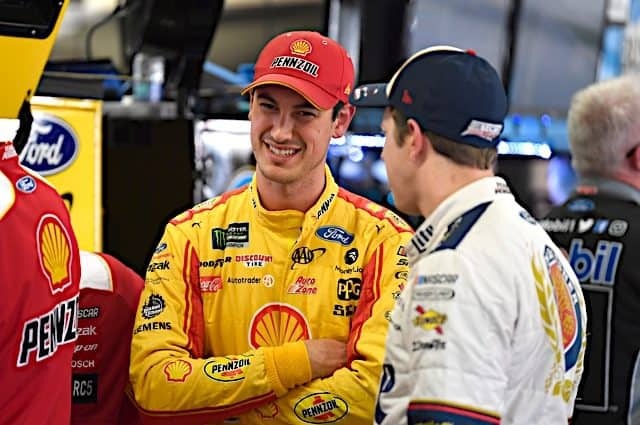 Assuming he wins and lead the most laps and Crafton finishes second while leading at least one circuit, Jones would walk away with a 21-point advantage headed into the final race of the year, and if Crafton were to lead the most laps and take the win at Homestead, he would have to hope for disaster for the No. 4 team as Jones would have to finish 23rd or worse for Crafton to take the championship on a tie-breaker, something that has happened just once (Gateway – electrical problems). In all fairness, if we were to switch those numbers around in Crafton’s favor for a dominating win at Phoenix, things would tighten up a little. 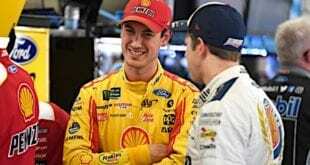 Assuming the same scenario with both roles reversed, Jones would walk away with a 12-point lead, leaving the advantage still squarely in his hands as a finish of sixth or better, regardless of any laps led would lock up the championship. Even with those numbers being hypothetical, simply put, at this point, the championship is Jones’ and the No. 4 team’s to lose, and frankly, that’s just not going to happen in the next two weeks. 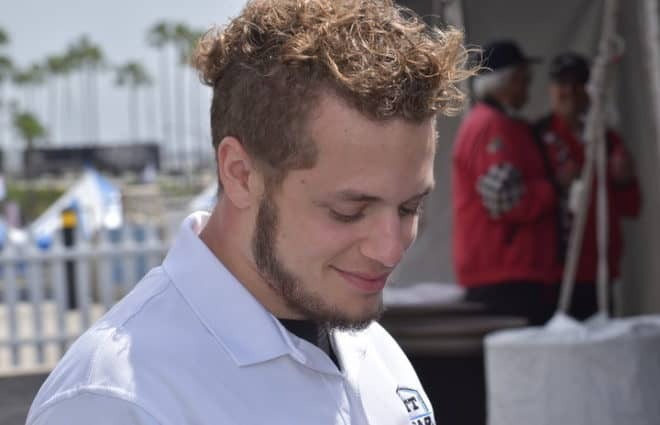 Tyler Young, who has shown steady improvement throughout the season in his family owned No. 02 Chevrolet, came his home track of Texas with high hopes for a solid run. But it wasn’t meant to be for the 25-year-old. When Young took the No. 02 out for qualifying, smoke poured from the back end, signaling a blown motor and forcing the team to scramble to change it in time for the race. The Midland, Tex. native and his crew got the replacement engine into the truck and even gained nine positions after the green flag flew, but an early flat tire sent him to pit road for an extended stop under green just five laps in. After spending extra time on pit road to ensure there were no further issues with the truck, Young returned to the track, but the damage was already done as he had lost six laps to the leaders. He went on to finish a disappointing 23rd, 11 laps off the pace. Multiple drivers struggled with green-flag pit stops Friday night, sliding their tires as they attempted to slow down to pit road speed. John Wes Townley got the worst pit road entry, though, as he suffered a commitment cone violation and took the commitment cone for a ride along with him. He had to pit for a pass-through penalty under green, which trapped him off of the lead lap. He ended up 17th, three laps down to the race winner. 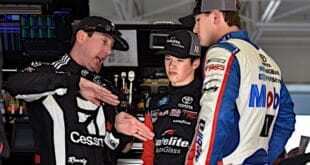 Friday night’s race was the fastest ever Camping World Truck Series event run at Texas Motor Speedway. With just one caution to slow the field for five laps, the official race time was one hour, 23 minutes and 48 seconds. Jesse Little returned to Truck Series competition for his third career start behind the wheel of the No. 97 ThorSport Toyota. 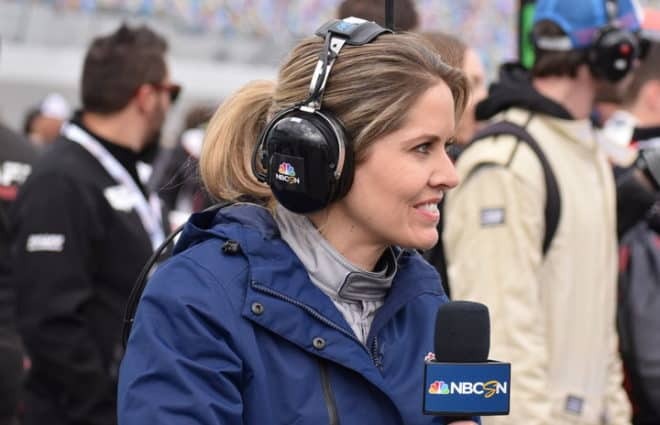 After suffering a pair of 30th-place DNFs at Dover and Chicagoland earlier this year for a crash and engine failure, respectively, Little brought home a career-best 15th-place result. No. 07 Ray Black, Jr. Points Update: The top 23 in the point standings remains unchanged; Timmy Hill moved up one spot to 24th over Austin Theriault, who has been sidelined since his Las Vegas crash and is expected to remain out of the seat until at least the season finale at Homestead. Erik Jones answered Matt Crafton’s Martinsville win with a Texas win of his own and expanded his point lead to 17 over Crafton with two races remaining. 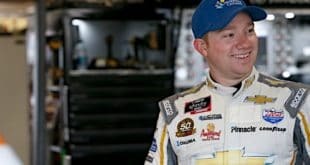 Tyler Reddick now sits 21markers behind Jones, who won in dominating fashion at Phoenix (the next track the Truck Series visits) last season. Johnny Sauter is 71 markers behind, and Timothy Peters rounds out the top 5 with a solid 20-point cushion over sixth. Rookies Cameron Hayley and Daniel Hemric sit sixth and seventh, respectively. John Wes Townley remains eighth, followed by Ben Kennedy and Spencer Gallagher to round out the top 10. Little movement can be expected in the remaining two weeks with each position from fourth through 11th separated by at least 20 points. Up Next: The Camping World Truck Series heads to Phoenix International Raceway next Friday night. 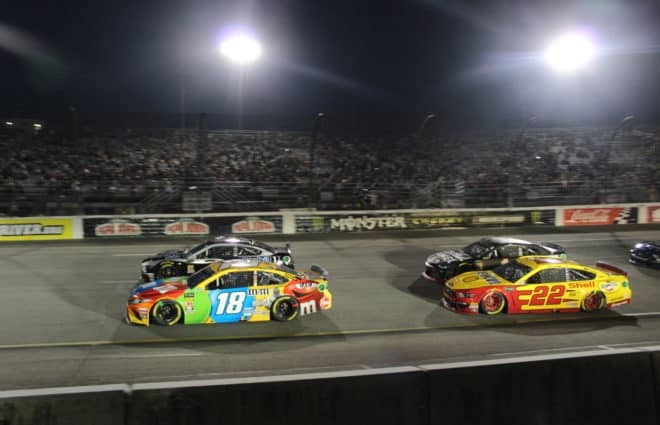 Last season, Erik Jones dominated, leading 114 of 126 laps (race shortened due to power outage) en route to the victory over Matt Crafton under caution. Coverage for the Lucas Oil 150 begins at 8:30 p.m. ET on FOX Sports 1; the race can also be heard on your local MRN affiliate and SiriusXM NASCAR Channel 90. And now NASCAR is trying to ruin this series with a Chase type championship. NOOOOOO!!!!!! I know that the trucks have been going to Texas twice since 1999 and I do love the truck series but a race like this one is making me confused on why we go here twice a year. I think there are better options out there but I doubt that’s going to change anytime soon.